Captain Jason Dozier and the team at FshnFl will guide you on an unforgettable Shark fishing expedition in Tampa Bay. Captain Dozier is a Florida native. He grew up reeling-in fish from Florida’s inter-coastal waterways. His passion for reeling-in the region’s Hammerhead, Bull, Blacktip, Bonnethead, and Atlantic Sharpnose Shark is contagious. Tampa is Florida’s topmost Gulf Coast City! The city is renowned for energetic nightlife, unadulterated mangrove, and Shark fishing. Shark are abundant in Tampa Bay’s inshore waters. It’s true, many species of Shark dwell among the region’s shore. Don’t fear: despite Tampa Bay’s copious Shark population few swimmers have ever been bitten. Most inshore dwelling Sharks are not dangerous to Humans, although they’re fierce predators of fish. There’s nothing as awe inspiring as witnessing a Shark thrash on its prey – it’s the cycle of life – raw, terrifying, unedited and beautiful! Tampa Bay is one of the most shark-infested waters in the world. During the summer months (July, August, and September), Fishin’ Fl. offers exciting shark fishing charters in Tampa Bay. If you have ever wanted to wrestle with one of the world’s most proficient predators, you owe it to yourself to go on a Tampa shark fishing charter with Fishin’ Fl. Tampa Shark Fishing Charter F.A.Q. When is the best time to shark fish in Tampa Bay? Fishin’ Fl. runs shark fishing charters during July, August and September. There are sharks in the area year round but the warmer months provide the best action. Fishin’ Fl. runs most of his shark fishing charters out of Tampa Bay directly. How big do the sharks get? We can go for small blacktips, bonnetheads, and sharpnose sharks in the 2-3 foot range or we can target the big boys like bull sharks and hammerheads which can exceed 10 feet long and weigh as much as 500lbs. the choice is up to you. It’s essential to deploy heavy tackle to reel-in the ocean’s most revered hunter, the Shark. Light tackle makes for an exhausted angler and a dead Shark. Professional anglers suggest deploying a heavy spinning rod to reel-in the fierce Shark, especially along the coast. Spinning rods don’t offer the leverage a traditional rod does, and leverage is required to reap a Shark from deep waters, however, the Shark’s struggle along inshore waters is parallel with the coast, not vertical. What types of sharks do you target? Captain Dozier’s Shark fishing charter are thrilling, not only due to the Shark’s size, but the diversity of Tampa’s Shark population. Many times the angler doesn’t know what’s on the hook until it’s boat side. The Shark’s powerful incisors and impressive size are revealed in a way that no footage from Shark Week could ever do. Embark on the an unforgettable fishing trip with Captain Dozier. 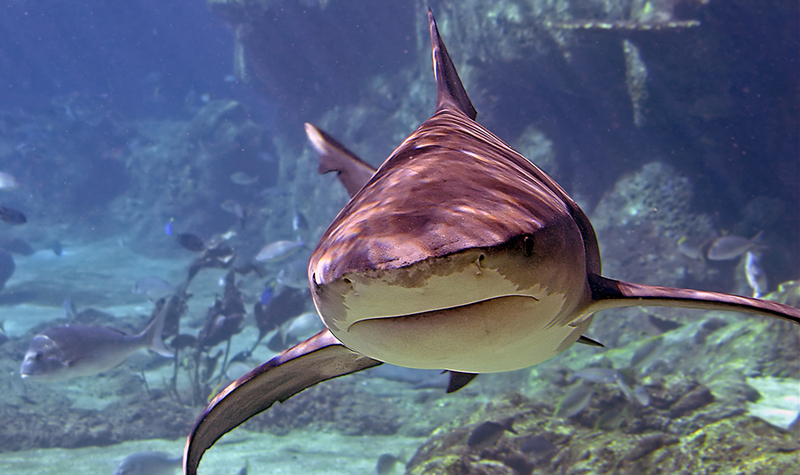 Captain Dozier and his team offer a family friendly experience – the experience of encountering a Shark first-hand! There’s no rush like reeling-in the ocean’s most revered predator. Moreover, it’s not by chance that Tampa Bay offers superior Shark fishing, Tampa Bay is Florida’s largest saltwater estuary. The estuary is swarming with fauna and flora. Are you ready for your Tampa shark fishing charter adventure?